The Skinny: So silly it should be illegal. Returner's story is lifted from about fifty other movies, and the emotional content could only affect the easily-manipulated. However, for throwaway multiplex thrills, this SFX-laden sci-fi thriller is appropriate fluff. If Luc Besson made E.T., the likely result would be Returner, a sci-fi special effects extravaganza that's the very model of manufactured thrills. Directed in an attractively shallow manner by Takashi Yamazaki (Juvenile), Returner possesses a plot that's been lifted from about fifty other films. Aside from E.T., you can also throw in plot points and concepts from Terminator, Independence Day, Mission: Impossible 2, The Matrix and, if you search hard enough, probably even Kate and Leopold. The abundance of unaffecting acting, thin plotting and obvious superficial thrills will likely put off some. Everyone else, however, could be reasonably entertained by the film's commercial excess. 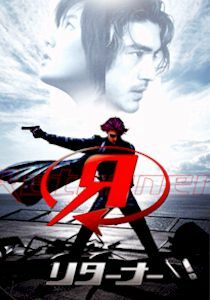 Those who think movies are all about stuff blowing up: Returner is for you! 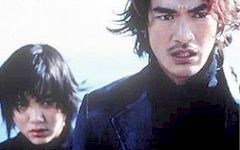 Takeshi Kaneshiro stars as Miyamoto, a too-cool gun for hire who wears long leather coats and carries the latest handheld weaponry. On his latest gig, he runs afoul of Mizoguchi (Goro Kishitani), the designated bad guy who's long been the object of Miyamoto's hatred. Mizoguchi doesn't know why Miyamoto has it in for him, and it's likely that he doesn't care. Mizoguchi is a cinematically bad sort, who behaves in comically evil ways and shoots kids, women and the elderly without a second thought. Goro Kishitani must have studied Gary Oldman's moves frame-by-frame, because his performance hits exactly the same notes as Oldman did in many of his famous bad guy turns. Like Oldman, Kishitani's bad guy antics can be gleefully funny. Also like Oldman, he has a penchant for overacting. Miyamoto has the option of offing Mizoguchi, but he's interrupted by a mysterious girl (Juvenile's Anne Suzuki) who appears literally out of nowhere. Named Milly (Why all the "M" names? Beats me. ), she's the last hope of future mankind, who are fighting a losing battle with alien invaders. According to Milly, the first extra-terrestrial ignited a war, and she's here to stop it. She just needs Miyamoto's help. Unfortunately, Miyamoto thinks she's a wack job. To gain his help and/or trust, Milly uses her spiffy future technology: a keen watch which slows down time (a useful device for cool "bullet time" effects), and some miniscule bombs which could detonate Miyamoto's head. Once she attaches one to his neck, he's game to help her. Miyamoto and Milly spend the next two hours trying to track down the alien spacecraft, which has been appropriated by the government. Thanks to movie-logic, Mizoguchi is after the spacecraft too, and possesses connections which allow him to walk around top secret military facilities without anyone batting an eye. In their quest to take down E.T., Miyamoto has another shot at killing Mizoguchi. And, the audience gets the chance to discover just why Miyamoto wants Mizoguchi dead, and whether or not Milly's future is as it seems. Plus, we get gunplay, gratutitous slow motion, and enough Takeshi Kaneshiro to slaughter untold slumber parties of teenage girls. Depth, thy name is not Returner. Writer-director Yamazaki loads the film with minor "moments," like Miyamoto buying new duds for Milly and teaching her the wonders of pasta al dente. 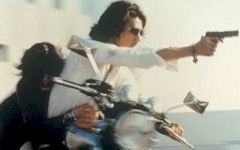 There are also the occasional sequences where two people stand around near a motorcycle or some wrecked machinery and relate their personal demons to one another. Those stories are usually not inspired or surprising; it's just backstory which is meant to give some humanizing element to all the explosions and special effects. People who've seen only two movies in their entire life could be touched by Returner's sentiments. Those who've seen three or more films will probably be more enchanted by Takeshi Kaneshiro's leather coat, a finely-crafted garment which looks even better in slow motion. If you want solid emotional content, an episode of Friends would probably be a better bet than Returner.